Could Benign Neglect be the Best Government Policy? - Create! Teach! Inspire! Could Benign Neglect be the Best Government Policy? I love plants but only the hardiest of them can survive my lack of gardening skills. A couple of recent plant-related incidents made me think we would all be a lot better off if our legislators governed the way I care for my plants. 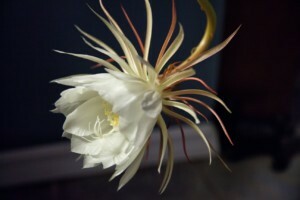 We have an orchid cactus that blooms rarely and only at night. The blossom is stunning (see photo). We had the plant for years before we saw it bloom the first time. 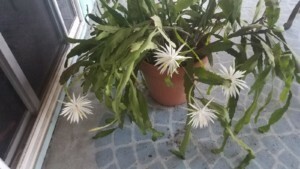 It was in a small pot on our front porch and was lucky to get watered once a week. But it thrived. Our friend’s plant in bloom. Friend: 4 blooms overnight. The most ever. Me: What are you feeding it?? Friend: That’s the best policy. Can we teach it to Washington? 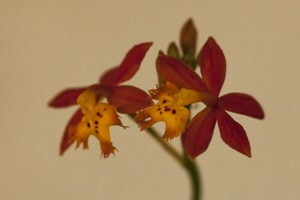 Another friend grows beautiful orchids. Her yard is gorgeous—a sharp contrast to ours, because we do just enough to avoid letters from the homeowners association. She gave me a couple of small orchid plants from a large plant that she separated. I was confident that I would kill them in short order, but after a few months, one of them bloomed. Omg, that is awesome! Look how green ur thumb is when u ignore stuff! It occurs to me that people are a lot like plants. Most of us are stronger than we look and able to survive and even thrive without a lot of external care. Give a plant too much water or fertilizer and it won’t do well—in fact, it will likely die. Give people too much care and they eventually lose the ability to be self-sufficient. It seems to me that benign neglect is an effective plant care policy and it would be an even more effective government policy. We don’t need an over-caring government “gardener” that may have good intentions (or not). Let the government provide for public safety and the common defense, as well as serve as a safety net for the truly needy. For everything else, the government should practice benign neglect. Let us take care of ourselves—we can do a better job and probably produce stunningly beautiful blooms.